Thrombus remains a limiting factor for achieving percutaneous coronary intervention (PCI) success during acute coronary syndrome, as it increases procedural complications (including distal embolization, no- reflow or stent malapposition) [1,2]. Thromboaspiration (TA) techniques can improve these results by reducing thrombus load within the culprit lesion, but its actual efficiency on thrombus volume remains unknown and the real benefits of the technique are debated . Moreover, the angiographic assessment of residual thrombotic burden following TA is suspected to provide several inaccuracies. In this work, we assessed the feasibility of residual thrombotic burden quantification following TA by optical coherence tomography (OCT) in STEMI and its relation to angiographic parameters. Patients with acute STEMI (symptoms onset ≤ 12 h) with initial TIMI 0 or 1 flow and high thrombotic burden (Thrombus TIMI grade ≥ 3) on culprit lesion and who benefited from successful mechanical thrombus aspi- ration (defined as TIMI flow ≥ 2+ chest pain cessation + ST elevation resolution N 50%) with no use of balloon predilation were screened for inclusion. Our local Ethics Committee approved the study and informed consent was obtained for each patient. All procedures were performed through radial access. Patients were treated in accordance with the European Society of Cardiology (ESC) guidelines for management of patients with STEMI . PCI was performed with a 6 Fr guiding catheter in all patients. Thrombo-aspiration was performed using a manual thrombectomy device (Eliminate. TERUMO, Tokyo, Japan). The number of passes was left at the operator discretion, in order to obtain optimal flow and satisfactory angiographic result. Culprit lesion OCT analysis was performed following TA in patients with successful procedure with a commercially available system (C7 System; LightLab Imaging Inc./St Jude Medical, Westford, MA). 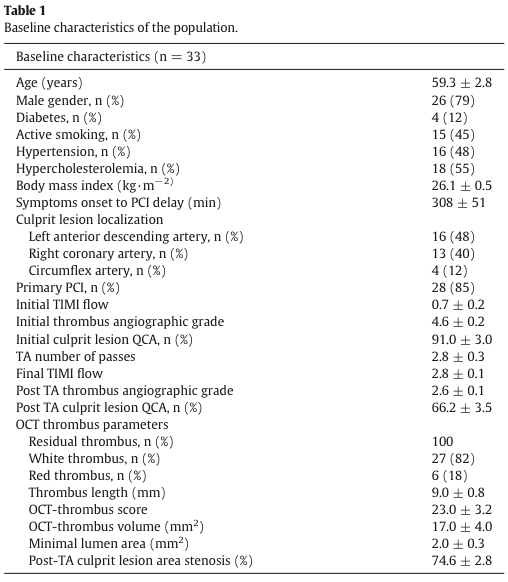 Two operators retrospectively reviewed coronary angiography and analyzed pre and post-thrombectomy culprit lesion characteristics, including antegrade angiographic flow, thrombus grade according to the TIMI criteria as well as the percentage of stenosis (before and after thrombectomy) by quantitative coronary angiography. FD-OCT image analysis methods have been extensively described elsewhere . Briefly, thrombi were defined as masses protruding into the vessel lumen, discontinuous from the surface of the vessel wall and characterized according to the signal characteristics. The longitudinal view was used to mark and measure the length of the athero- thrombotic lesion. The outlines of lumen and thrombus were drawn for area measurements on cross-sectional images by multiple point trace function within the athero-thrombotic culprit lesion in 1 mm intervals, allowing calculations of the OCT-thrombus volume, OCT- thrombus score and area stenosis. Proximal and distal reference lumen areas, as well as minimal lumen area (MLA) were measured for each lesion. References were defined as the most “normal-appearing” segments 5 mm proximal and distal to the lesion shoulders by OCT. The reference lumen area was the average of proximal and distal references lumen areas. Percent area stenosis was calculated as follows: 100 ∗ (reference lumen area − MLA) / reference lumen area. Data are expressed as mean and standard error to the mean (SEM). Continuous and categorical variables were compared using the Student t-test and the chi-square test or Fisher’s exact test. Univariate correla- tions were assessed by Pearson’s correlation or Spearman’s rho (ρ) test after log-transformation of variables. OCT thrombus indices were correlated (Spearman’s ρ = 0.47, p = 0.02) but did not correlate with any of the post-TA angiographic charateristics, including post-TA QCA (OCT thrombus volume: Spearman’s ρ = 0.19, p = 0.3; OCT-thrombus score Spearman’s ρ = 0.2, p = 0.35) and post-TA angiographic thrombus grade (OCT thrombus volume: Spearman’s ρ = 0.17, p = 0.38; OCT-thrombus score Spearman’s ρ = 0.22, p = 0.28). However, we observed a mild correla- tion between degrees of stenosis estimated by angiography (QCA) and by OCT (area derived percentage) (Spearman’s ρ = 0.44, p = 0.02). Patients were divided into 2 groups according to the post-TA angio-graphic analysis: optimal (QCA ≤ 70%) and sub-optimal (QCA N 70%) result. 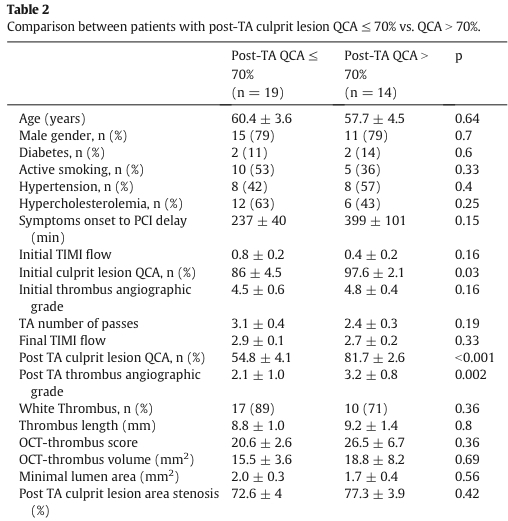 We didn’t observe any significant difference in the thrombus OCT characteristics between the two groups, suggesting that angiography and QCA accuracies for evaluation of thrombus burden in STEMI are limited. This study is the first to our knowledge that used intra-coronary imaging OCT techniques to specifically investigate immediate results of TA in STEMI patients. Our results provide novel insights on this technique as they show that: 1) complete retrieval of thrombus can hardly be achieved with TA alone and 2) angiography is not an efficient tool to assess the procedural success. These data are in line with previous observations in non ST- and STEMI patients treated by TA and PCI, in which OCT depicted the presence of residual thrombus within stent [6,7]. Altogether, these results indicate that manual thrombectomy might have a limited role to completely remove thrombus from the culprit lesion. In this perspective, our data suggest that a 2 steps-approach (initial thrombectomy followed by deferred stenting) could be proposed in some selected STEMI patients, with the presence of abundant thrombus following ini- tial TA . An optimal medical therapy (including anticoagulation + double anti-platelet therapy) should be provided between initial and subsequent PCI, allowing adequate thrombus regression . Since angiography has a limited sensitivity to detect residual thrombus, OCT might thus represent a better option to guide this specific management option. Drs. Amabile and Caussin received consulting fees from St Jude Medical; the other authors reported nothing to disclose in relation with the present article. 1 – M.Singh, P.B.Berger, H.H.Ting, .S.Rihal, S.H.Wilson, R.J.Lennon,etal.,Influence of coronary thrombus on outcome of percutaneous coronary angioplasty in the current era (the Mayo Clinic experience), Am. J. Cardiol. 88 (2001) 1091–1096. 2- N.Gonzalo, P.Barlis, P.W.Serruys, H.M.Garcia-Garcia, Y.Onuma, J.Ligthart, etal., Incomplete stent apposition and delayed tissue coverage are more frequent in drug- eluting stents implanted during primary percutaneous coronary intervention for ST-segment elevation myocardial infarction than in drug-eluting stents implanted for stable/unstable angina: insights from optical coherence tomography, JACC Cardiovasc. Interv. 2 (2009) 445–452. 3-O.Frobert,B.Lagerqvist,G.K.Olivecrona,E.Omerovic,T.Gudnason,M.Maeng,etal., Thrombus aspiration during ST-segment elevation myocardial infarction, N. Engl. J. Med. 369 (2013) 1587–1597. 4-P.G.Steg, S.K.James, D.Atar, L.P.Badano, C.B.Lundqvist, M.A.Borger, etal., ESCguidelines for the management of acute myocardial infarction in patients presenting with ST-segment elevation: the Task Force on the management of ST-segment elevation acute myocardial infarction of the European Society of Cardiology (ESC), Eur. Heart J. 33 (2012) 2569–2619. 5- N. Amabile, S. Hammas, S. Fradi, G. Souteyrand, A. Veugeois, L. Belle, P. Motreff, C. Caussin, Intra-coronary thrombus evolution during acute coronary syndrome: re- gression assessment by serial optical coherence tomography analyses, Eur. Heart J. Cardiovasc. Imaging (2014) (pii: jeu228, Epub ahead of print). 6 -M.Magro, E.Regar, J.L.Gutierrez-Chico, H.Garcia-Garcia, C.Simsek, C.Schultz etal., Residual atherothrombotic material after stenting in acute myocardial infarction—an optical coherence tomographic evaluation, Int. J. Cardiol. 167 (2013) 656–663. 7- W.G. Wieringa, C.P. Lexis, G.F. Diercks, E. Lipsic, E.S. Tan, R.A. Schurer, et al., The feasibility of optical coherence tomography guided thrombus aspiration in patients with non-ST-elevation myocardial infarction after initial conservative therapy — a pilot study, Int. J. Cardiol. 168 (2013) 4981–4982. 8- X.Freixa, L.Belle, L.Joseph, J.Tanguay, G.Souteyrand, P.L’Allier,etal.,Immediate vs. delayed stenting in acute myocardial infarction: a systematic review and meta- analysis, EuroIntervention 8 (2013) 1207–1216. Previous PostPESTO ou comment visualiser les thromboses de stent grace à L’OCTNext PostVery late stent thrombosis related to incomplete neointimal coverage ….